ATAS specializes in order flow analysis, cluster analysis, volume market profile and advanced technical analysis. A powerful combination of analytical tools increases market transparency, allowing traders to react quickly and make trade decisions effectively. Our platform is used by proprietary trading companies and professional traders throughout the world. A quick and simple connection to such popular data providers as Rithmic, CQG/Continuum, IQfeed, T4 (CTS), TT, Interactive Brokers, Plaza II, Quik with the possibility to trade through Rithmic, CQG/Continuum, T4 (CTS), TT, Interactive Brokers, Plaza II and Quik is enabled. We keep working on including more data service providers for even better user experience! There’s much more than just charts. 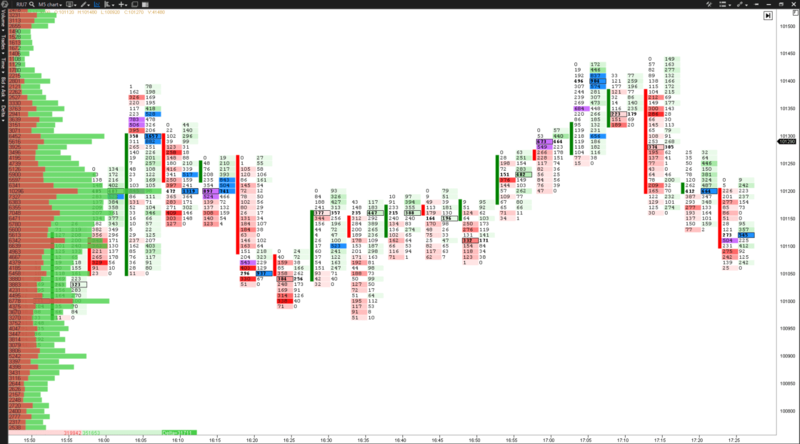 Visual analysis of order flow, cluster analysis, volume profile of market, etc. allow viewing the market from the inside and realizing its motivation. There is a possibility to set different formulas using any number of instruments, thus creating your own synthetic instruments! This option will be useful for portfolio analysis and pair arbitrage trade. Analysis of historical data (every tick, every trade) with possibility to link Print Tape to a chart. There are also continuous contracts for analysis at long time periods available. Try ATAS platform for free! Download your fully functional, 14-day trial version of ATAS! 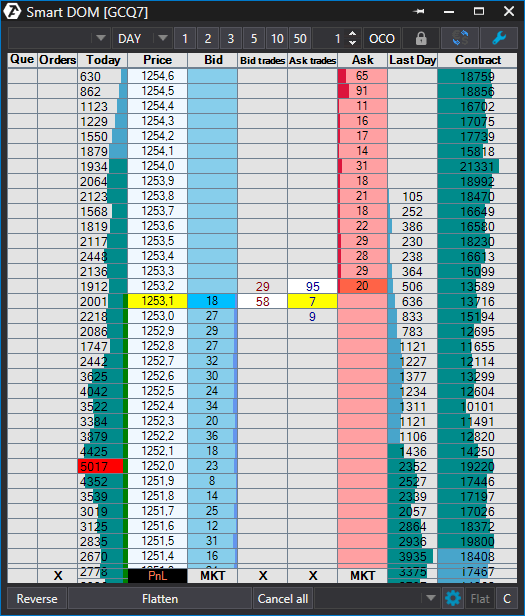 Starting from late 2009, you almost never see the real size of the executed orders in the ordinary NinjaTrader tape (Time and Sales). 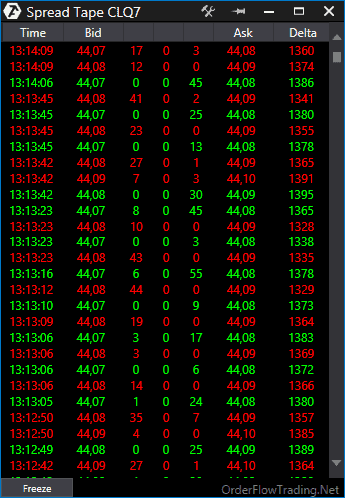 Almost every (especially large) market order is broken into pieces. For example, a 100 lots market order can be displayed in your ordinary tape in 100 individual prints. Since 2009 tape reading became very complicated, making conventional tape much less useful. But it doesn’t have to be this way! Our version of tape (Smart Tape), combines individual prints back together (the way it used to be before 2009) so that you can easily see the actual market orders to their full extent. There are also filters available in the Smart Tape so you easily sense what the bigger/smaller traders are doing at the moment. Also the Smart Tape is capable of displaying some other essential information including Iceberg Orders, and much more. This module allows to see the volume of trades, which were settled based on bid and ask in the process of the price movement. Thus, trades behavior can be analyzed at any given time while approaching a certain price level. 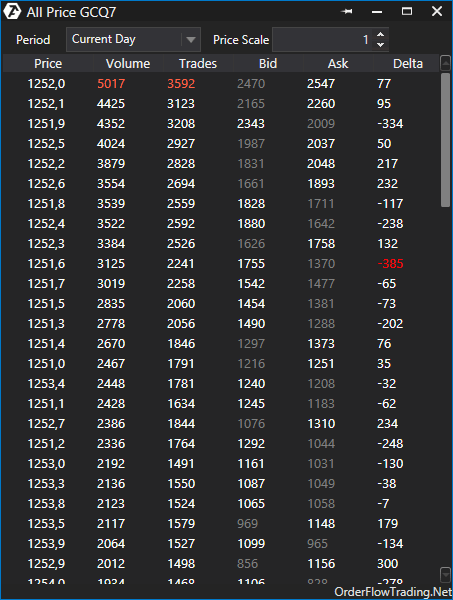 You can also see the volume settled inside the spread, and cumulative delta (calculated using data of all available prints from bottom to top). All calculations are similar to those we use in our Smart Tape, but info gets displayed in the form of clusters. This innovative approach makes it easier to embrace all the info (same info you see in the Smart Tape) in a form of a Tick Cluster chart. 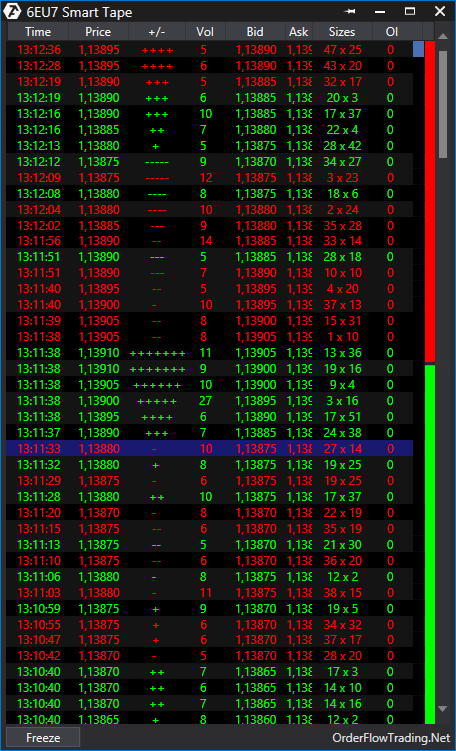 It allows you to see market orders executed with slippage. 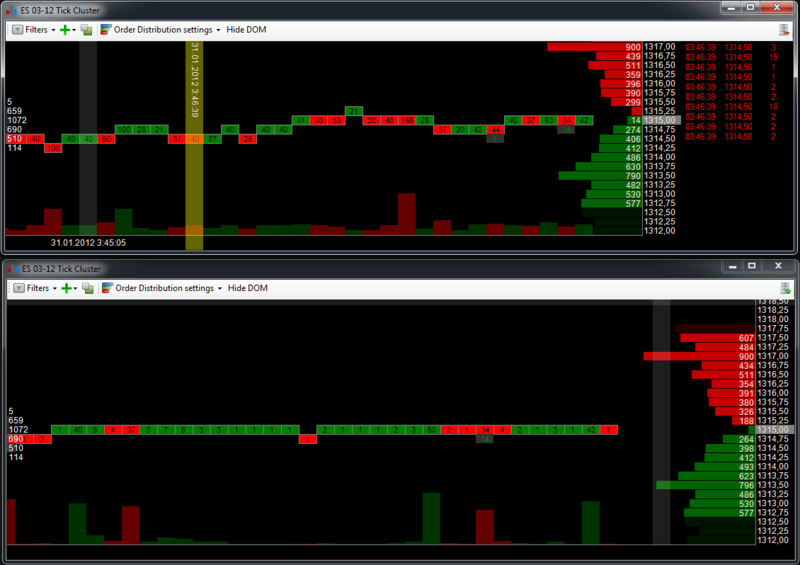 Also on a Tick Cluster chart you can see distribution of the current day volumes and Level II (DOM) data. This counter calculates volume for every price level. 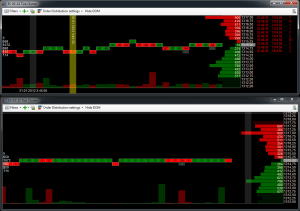 Allows you to locate price levels with max volume/bid/ask/delta/icebergs for a period of time of your choice. Many traders use these levels for their trading strategies. This innovative tool designed to spot and analize activity of high friquency algorithms – HFTs. Spoofing algos mostly designed to mislead you. For example a spoofing algo makes an order visible in the DOM for 9/10 of a second then within 1/10 of a second removes it from the DOM and puts it back on. It’s difficult for human eyes to sense these changes, therefore, it creates an impression of a big order. Linked windows creation. Any of the modules mentioned above can be created using the chart. The counters, at that, are linked to the chart. History viewing. If linked windows were created, any bars in which you want to view data can be marked in the chart. When specifying the interval, information for the marked range will be displayed in linked windows. This makes testing ideas using history very simple and convenient. Bar chart of volumes with the possibility to choose initial and finite interval (display options: Volume, Trades, Bid-Ask, Delta, Icebergs). A whole range of innovative indicators allowing transformation of order flow into a comprehensible form, easy and clear for visual perception.